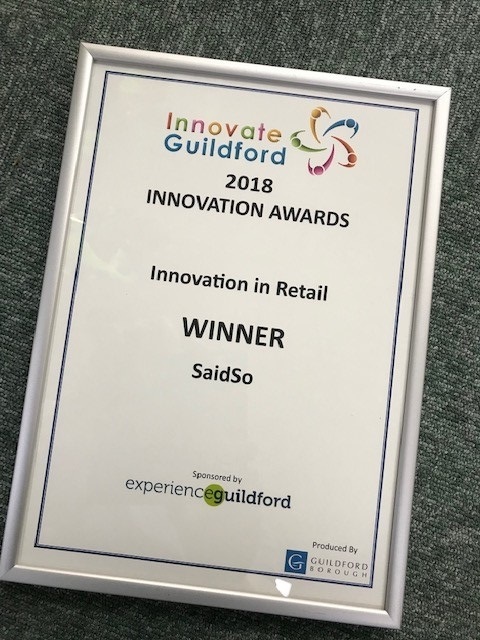 at the Guildhall in Guildford on the evening of 03 December 2018 as a finalist and winner in the Innovation in Retail category. The Guildhall is a stunning venue in the heart of Guildford High Street and it was a fabulous event. We were honoured to be a finalist alongside other innovative Guildford and Surrey based businesses. We are delighted to have won the Innovation in Retail award and a picture of our award is featured below. SaidSo.co.uk has continued to innovate from its launch at the beginning of 2015 and this is the fourth award the site (and our free Wealth Dashboard App) have received since launch.